Since interviewing RK Post at Grand Prix Atlantic City I’ve been trying to contact and engage other Magic: The Gathering artists in dialogue about life, fantasy games, and their work. 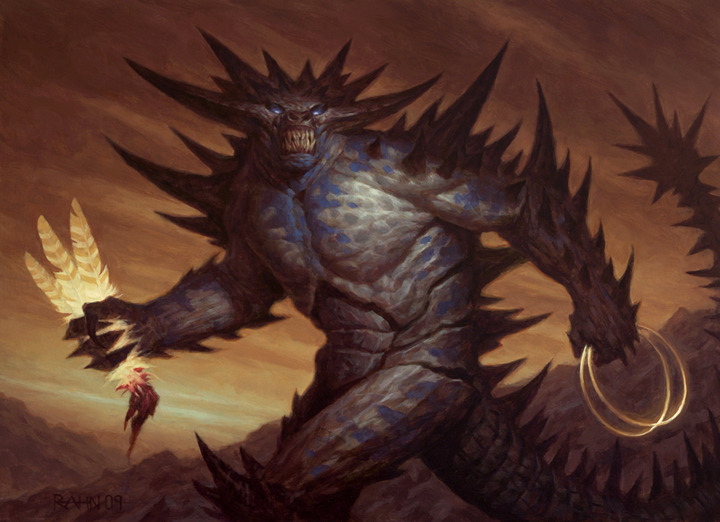 I’ve reached out to several artists and Chris Rahn is the first to respond consistently. He’s the the hand and visual mind behind Corpsejack Menace, Blightsteel Colossus, Craterhoof Behemoth, Crypt Ghast, and the greatest Magic card of all time, Huntmaster of the Fells/Ravager of the Fells. Gatherer says there are 71 Rahn illustrations throughout paper Magic’s history. A couple of months ago Rahn got to take a stab at new art for Black Lotus and totally nailed it. Chris Rahn is a freelance Sci-Fi & Fantasy Illustrator. His clients include Wizards of the Coast (Magic the Gathering), Blizzard Entertainment, Tor Publishing, Randomhouse Publishing, Discovery Channel Magazine, Harlequin, LA Weekly, & The Village Voice. I have written about how much I love is illustration of Lord of the Void previously on Hipsters. 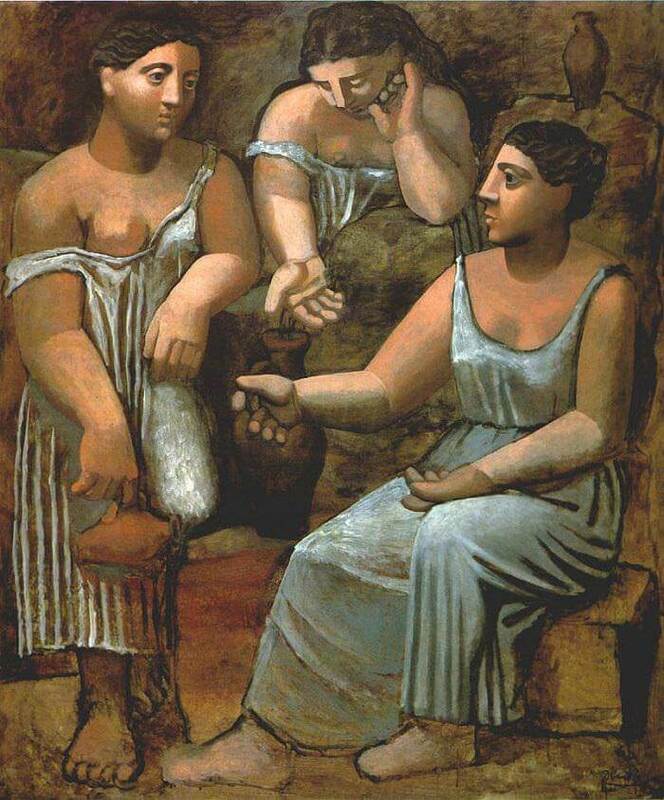 His style is a kind of fantasy art version of Picasso’s Neo-Classicism (1920-1930) period. Rahn’s figures bear a similar physical and emotional weight. Picasso. Three Women at the Spring, 1921. I’m grateful to Chris for taking the time to answer these questions, pedantic as they seem to me now in retrospect. His work is amongst my favorite in Magic: The Gathering and some day, when I’m wealthier than I am now, I’ll buy one of these sweet paintings off of him. Matt Jones: Chris, thanks for writing me back and for participating in this interview! I’m probably gonna start off with some basic questions and we’ll build from there. Where were you born and raised? Chris Rahn: I was born in the Bay Area, north of SF but spent most of my childhood in Washington State. It’s a little farming town in the south eastern corner of the state called Dayton. I moved back a few years ago, with my wife Beth, after living in SF and Portland. MJ: What was the reason for the move back home? I have an artist friend who says we draw great power from our home town and it’s wise to go back there. He travels to his hometown of Auckland once or twice yearly for this purpose. He says it’s where one’s mana comes from. Is your experience similar? CR: Well, I can see what you mean. Actually our reasons were family related, we had a family member that got a terminal diagnosis so we moved back to spend time with them. Afterwords, we just found that we were happier here than in Portland so we decided to stay. MJ: When did you notice that you had a gift for illustration/drawing/painting/etc.? CR: Well, I always liked to draw as a kid. I think a lot of it is that I just never stopped. All the other kids moved on around the third grade and I just kept at it, not a lot to do for a nerdy kid growing up in the middle of nowhere so it was an escape for me. MJ: I couldn’t agree more. Artists are the ones who don’t stop drawing, ever, when all the rest of the kids do. I think it has something to do with getting positive reinforcement and liking this feeling and wanting it more. That compelled me when I was a kid to draw more and draw better. Also, bonus, if you draw it’s really hard to be bored. What kind of things did you draw as a kid? Are there any specific drawings or paintings that you remember? Can you talk about them a bit? CR: X-Men, Ninja Turtles, Monster Trucks, lots of weird mutants and monsters more than anything. In terms of specifics I had a drawing of Wolverine that I was pretty proud of for a while there. MJ: Did you go to art school? CR: Yes, I went to the Academy of Art in San Francisco, majoring in Illlustration. Oddly a lot of M:TG artists went there, Jason Chan, Daarken, Tyler Jacobson and others. MJ: That’s crazy! You had your own sort of NY School circa the 1950s but for fantasy illustration. Did you know each other and have a community of like minded artist-illustrators or did it just work out that you all ended up becoming fantasy illustrators and working with Wizards? Did it ever feel like you were all onto something, brains syncing, that kind of thing? Sometimes at art school it felt that way for me and my main artist friends – like we were really doing something original and interesting. MJ: What’d you think of the Academy of Art? CR: It was a good program, they focused more on traditional illustration but I was able to get a lot of fantasy/sci-fi pieces done while I was there. MJ: Do you have any good art school stories? CR: Most of my stories are just about everyone partying too hard to blow off steam, the program was so intense that we were all zombies most of the time, lots of all nighters and turning in wet paintings. MJ: Yeah, that’s my experience, too. Ha! How’d you get into the business and establish a professional relationship with so many amazing companies (WotC, Blizzard, etc.)? CR: Well, I was lucky to get signed to an artist rep. (like an agent) at the end of my last year. They represented a couple of my instructors and took an interest in my work. I’m still with them today, they’re called Lindgren and Smith. They eventually hooked me up with WotC and Blizzard came soon after. MJ: Having gone to school for illustration and achieving great success with it, I’m curious to hear your opinion on the fine art world, galleries, museums, things like that. I grew up loving comics and fantasy art but ended up going to art school for fine art (mostly because my school didn’t have an illustration program). The differences between working for a client in a specified genre and working towards exhibitions in galleries are interesting to me. I think we all do basically the same thing, art-artists and artist-illustrators, which is work creatively to satisfy our curiosity, solve problems, and present our work to an audience. What do you think? CR: I agree, I think way too much is made of the differences between the two worlds. At the end of the day in both cases, it’s you painting something the best way you know how and someone else buying it. Both fields have their own challenges but too often people use the divide as an excuse to be condescending to folks on the other side. MJ: What’s your favorite piece you’ve made in the last two years? CR: Hmm, it’s not for Magic. It’s a book cover I did for Tor of a dragon-rider attacking an airship. The book’s not out yet but it’s up on my blog. The book’s called Storm Riders. It was a lot of fun because I could set aside a lot of time for it since it was such a big job and I was able to get it pretty close to the original vision I had for it. MJ: Who are your greatest artistic influences? CR: NC Wyeth, Brom, Odd Nerdrum, Donato, Gurney, Wayne Barlowe just to name a few. Another is a teacher I had at the Academy named Kazu Sano. His work is definitely worth checking out. Email is a difficult way to conduct an interview. The phrasing is less casual, less like a conversation, because you’re not really having a conversation. Chris hit us with some great factual information and some personal insight. I’d love to have another go at this on Skype, the phone, or, best of all, in person at a Grand Prix or other event. Artworld art and fantasy art aren’t the same thing and I’m highly critical and obsessed with both. I keep my criticism in each world separate from the other, or try to, but cross overs happen, of course. Rahn’s work is up there, very good, probably even in my top ten fantasy artists list. His response to the last question, the one asking about his greatest artistic influences, threw me a bit. I’ve always thought Odd Nerdrum as a hack, similar to the way I think John Currin is a hack. NC Wyeth, like Andrew and the other Wyeth’s, have cornered the market in a kind of American rural nostalgia. They’re all very honest and clear, not deceptive and dark like Currin and Nerdrum, which I respect fully. Brom rules, I’ve got no criticism for that. The others, too, are fine as illustrators. I see guys like Chris Rahn as a bridge between fine art and things like Dinotopia. The work is clear, committed, and incredibly well done. 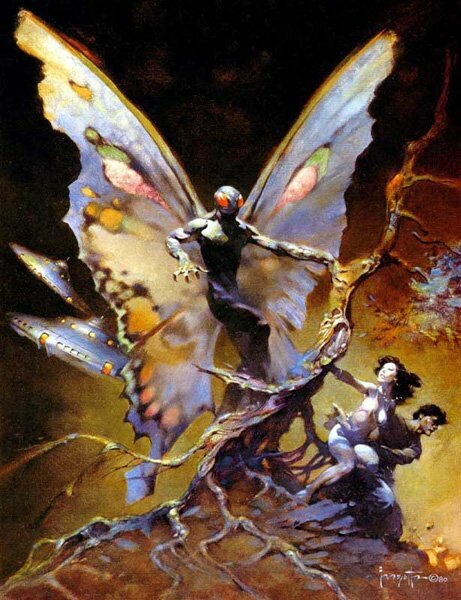 Like Frazetta, Rahn is a serious painter with a powerful and unique style and attitude. The work deserves similar attention and recognition. I was surprised Frazetta wasn’t on his list of influences and the more I think about it the more the two have in common visually. I hear what Rhan’s saying about the condescension an Artworld artist can have for a fantasy artist. It’s sometimes hard to convince people that the two things are separate but equal and that one can have an opinion on fantasy art that doesn’t impact one’s opinion on Artwold art. It’s a dialogue I participate in as often as I can. The rules of both games seem malleable and incredibly relativistic. Both worlds are incredibly valuable and inspiring.